A chin implant is most commonly used to add or alter the shape of a person's chin to create a better balance and proportion with their facial features. However it can also be used to add fullness in an under-projected or receding chin. Most chin implants are made from solid silicone or a material called Medpore. 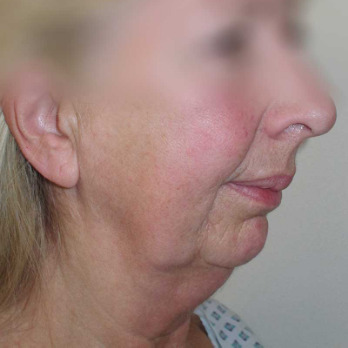 The medical term used to surgically enhance the chin is called a 'chin augmentation' and it is a specialised proceedure. It can also be referred to as a 'chin correction'. Chin augmentation requires careful planning to achieve a result which is proportional to the rest of the face. 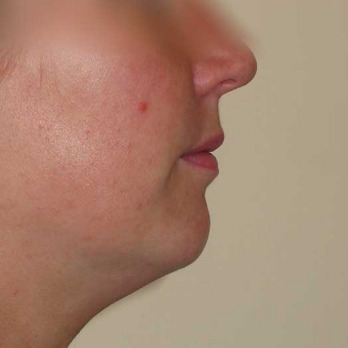 The most common request from patients is to increase the projection of the chin. Since an analysis of facial proportions is very important, this surgery is often carried out in conjunction with a Rhinoplasty (nose surgery). Occasionally, contouring of the neck can enhance the profile of the chin and therefore liposuction under the chin or on the neck may be carried out in combination with the implant. Mr Chana will discuss the chin augmetation process in full detail at your initial consultation. He will also explain the advantages and disadvantages of the different inplant materials and what will suit you best. A chin augmentation is performed under general anaesthesia. There are two ways to insert the implant. One involves making an opening inside the mouth (in the groove in front of the lower teeth at the bottom of the inside of the lower lip) and the other involves making an incision in the skin crease under the chin which will result in an external scar. 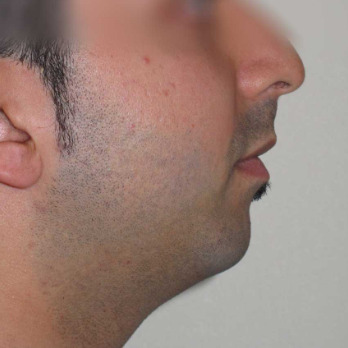 It is usually preferable to avoid a scar, but some types of chin implant may require this method for better insertion. A pocket is made to allow the chin implant to sit tightly next to the chin bone and the facial tissues are closed over it. Pain is surprisingly uncommon after a chin augmentation and is relieved by mild analgesic tablets which Mr Chana will prescribe. Aspirin or aspirin-like medication (non-steroidal, anti-inflammatory tablets) must not be taken. In the event of an incision being made inside the mouth, Mr Chana will insert dissolvable stitches. There is usually minimal bruising and swelling. Postsurgery, you should be able to eat and drink normally, however you must be careful not to pull the lip forward. You will also be instructed on how to carefuly brush your teeth using a small toothbrush. 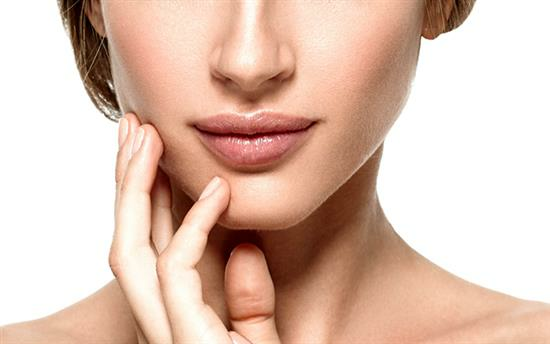 Serious complications are rare following chin augmentation surgery. Infection is the main risk and you will be given antibiotics during the procedure and for a few days after surgery as a precaution. In the very rare event of a serious infection, it may be neccessary to remove the chin implant and then repeat the surgery at a later date. Any permanent alteration to the sensation of the skin of the chin is exceedingly rare. 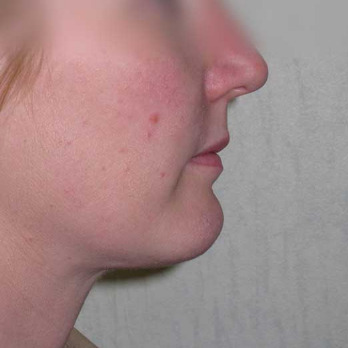 Displacement or malposition of the chin implant is also rare, but correctable. 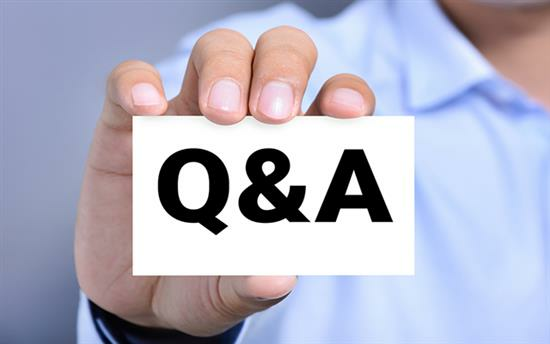 Mr Chana will provide you with a comprehensive information leaflet at your initial consultation. Is chin implant surgery right for me? If you feel your chin is small or set back from the rest of your face, then surgery may be the answer. 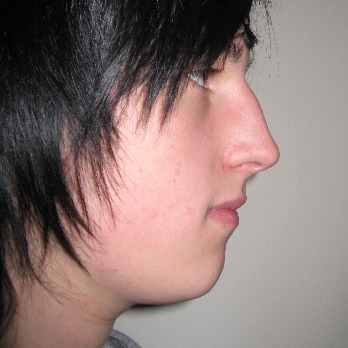 Viewed from the side, a small or recessive chin also makes the jaw line and neck appear short. Similarly, a small chin can make the nose appear larger than it really is. A chin augmentation (implant surgery) will improve all of these facial proportions. What are the different types of chin implant ? Chin implants can be made of silicone or a material called Medpore. Silicone implants are the most commonly used form of implant and are composed of a solid silicone rather than the soft gel which is seen in breast implants. Medpore implants are made of solid porous polyethylene and are usually reserved for patients undergoing reconstructive surgery. 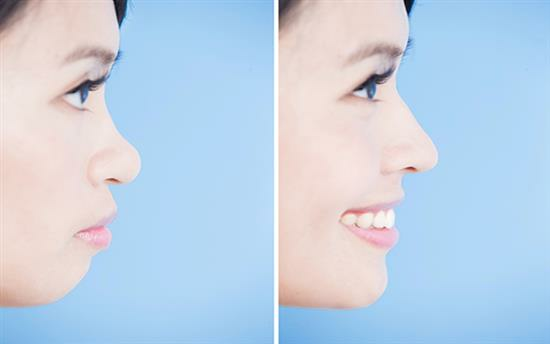 What are the different shapes and sizes of chin implants? Chin implants come in various shapes and sizes. Shape affects the differences in width which alters the shape of the sides of the chin. Size is to do with angle of projection of the chin. 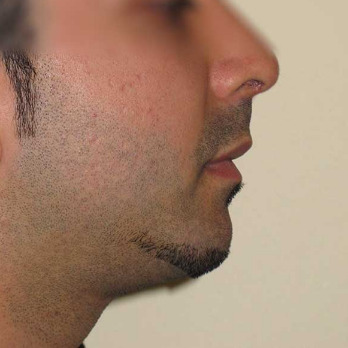 Sometimes, square profile implants may also be used in a male chin augmentation if they provide a better fit with an individual's overall facial appearance. Do chin implants need to be replaced? Unlike breast implants that need to be replaced after a few years, chin implants rarely need to be replaced unless there are changes resulting from displacement or a change in the face due to ageing. 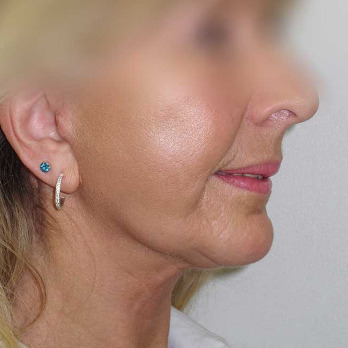 Is chin implant surgery painful? Chin implant surgery produces surprisingly little pain and mild painkillers will easily control any discomfort. There may be some temporary tightness of the lower lip after surgery, but this should subside within a week or two as the swelling goes down.